Q. I would think you have never heard of anything like this before, both semifinals having been canceled? RAFAEL NADAL: Yes. It's very unlucky, very unusual for something that can happen. Sorry for Kei, sorry for Tomas, and sorry for the tournament, especially sorry for the fans. Q. When did you find out about his withdrawal? It seemed like you were working really hard in practice, maybe a little bit more than normal. Did you find out before? RAFAEL NADAL: No, no, no. I practiced for almost one hour, 50‑something, 55. Is nothing strange on my warmups. Sometimes I practice a lot. No, I didn't know nothing. I know that just after, when I was back in the locker room, you know, one hour before the match. Q. Have you ever seen thisbefore in your career, two semifinals canceled? Do you remember it happening? RAFAEL NADAL: I cannot remember that, yeah. Q. And can you also tell me, your matchup with Djokovic a few years ago, I think he beat you seven times in a row, all finals. You really turned it around, like five out of six. Can you tell what do you think the difference was? Was it a matter of health or you changed something? RAFAEL NADAL: No, not health. I was healthy in 2011. I lost all the finals because Novak was in better shape than me, was better player than me during this period of time. Is true that I had chances in here, Miami. I lost 7‑6 in the third. I had 6‑5, 15‑30, and at Indian Wells I was set up. Then I lost in two sets in Madrid and Rome, and then Wimbledon four and US Open four. And then I lost the seventh in Australia. Very long match. It's nothing that ‑‑I don't want to forget these things. It's something that that was a tough year, but at the same time, a good year because I played a lot of finals. I was able to win Roland Garros too that year. And that seven straight loss probably motivates me to find solutions, to play more aggressive, to try to be better player again. So that's all. Is nothing very strange to lose against Novak a lot of times because he's an unbelievable player (smiling). Q. Speaking about Novak, can you look ahead to playing him in the final? What are your thoughts? 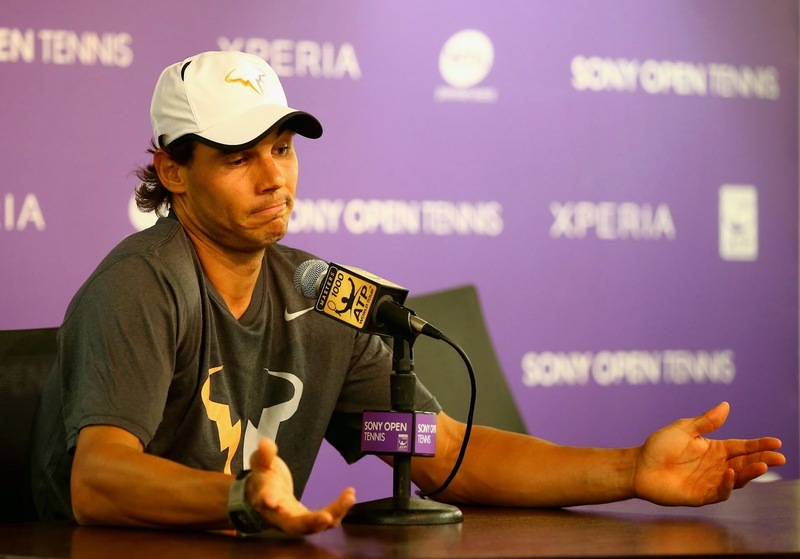 RAFAEL NADAL: My thoughts are always the same. Only chance to win against Novak is play to the limit, play my best, and wait that he not gonna have his best day. I will see. I know I have to be solid with my serve. I need to play aggressive, no doubt about that. That's it. We are playing in a court that today probably is his favorite court. That's hard. He arrives to the final with goods confidence after winning in Indian Wells. So that's fine. For me is very important result to be in the final of Miami, too, after Indian Wells be able to win the final and compete for the title in the tournament that I have a lot of friends, a lot of Latin crowd that support me a lot every day, and that's very important for me. To be in the final already are 600 points that for me, at this part of the season, are very important. Q. What are you happiest with in your game going into this final? RAFAEL NADAL: I played well the first three matches, and I think I finished yesterday the match playing much better again. You know, the match after tomorrow is a little bit. You know, you have to be at your 100%. The adrenaline have to be very, very high to play a little bit over your regular level. You're waiting also the inspiration of that matches that helps you to bring your level a little bit higher. But in general, I think I played more solid than what I did in Indian Wells and Rio, and I played with better movements, too. I lost my serve only one time during the whole tournament, and that's very important for me on this surface; in any surface, but in this surface, too. And in Rio and Indian Wells I lost the serve every, every day. Q. Sometimes players, when they get out of the rhythm of the tournament, when they miss a match and have to wait a couple of days and go back in, it throws them off. Do you see this, as missing a match today, is that going to happen to you? RAFAEL NADAL: I cannot predict the future, no. But if you play the match of today you never know if you will be playing on Sunday. Q. So you don't think it's going to disturb you in any way? RAFAEL NADAL: I think if I don't play well on Sunday, not going to be because I didn't play today. Q. You practiced with a local kid, Stefan Kozlov, today. He's the No. 2 junior in the world. Can you tell us how it happened and what you think of this kid out there, this young man? RAFAEL NADAL: He's great. I saw him play in Australia on the TV. He has very quick hands, powerful shots, flat shots. He's very young. He's 16 already. He already played the final of Australian Open. Is important, in my opinion, kids like him, that he's very good, start changing a little bit the mind, and my feeling is is important that that juniors players starts to compete with the professional players. Not here, because you don't have the ranking. But he has in the Futures. My feeling is when I was at that age, 15, 14, I already played in the Futures, and that helps me to be better earlier. So if you keep playing juniors, you know, at the end, you keep competing against guys that you normally will be able to win playing one way, but when you are playing Futures, probably you are playing against sometimes worse players, but at the same time, these worse players are able to put one more ball in, so they push you to do different things. That's one of the, I mean, in my opinion, one of the reasons why the players are starting the professional careers later today. Q. How hungry are you to get your first win in Miami? How much do you want this first win here in Miami? RAFAEL NADAL: I want to win every week (smiling). But I'm not gonna win every week. That's the real thing. No, when I go on court, when I start in the tournament, I always have the motivation, the passion, and the love for tournament that I'm playing. If it's 250, doesn't matter if it's 500, 1000 or Grand Slam. So for me, going on court and trying my best, don't make any difference if it's one tournament or another one. For sure, Miami is a very important tournament that I never had the chance to win in the past. Is my fourth final, by the way. It's positive results. To be able to play four finals in one tournament is because you did well, and I gonna try to be ready for Sunday. But you never know. You know, always the opponent is not the best opponent to play in a final of Miami (smiling).